Nelson Mandela never wavered in his devotion to democracy, equality and learning. Despite terrible provocation, he never answered racism with racism. His life has been an inspiration to all, who are oppressed and deprived, to all who are opposed to oppression and deprivation. He was born into the Madiba clan in Mvezo, Transkei, to Nonqaphi Nosekeni and Nkosi Mphakanyiswa Gadla Mandela, principal counsellor to the Acting King of the Thembu people, Jongintaba Dalindyebo. A Xhosa born to the Thembu royal family, Mandela attended Fort Hare University and the University of Witwatersrand, studying law. Mandela has been married three times; he was married to Evelyn Ntoko Mase from 1944 to 1957, and they had four children; he and Winnie Madikizela-Mandela were married from 1958 to 1996, and they had two daughters; and he married Graça Machel in 1998. He attended primary school in Qunu where his teacher Miss Mdingane gave him the name Nelson, in accordance with the custom to give all schoolchildren “Christian” names. Both his parents were illiterate, but being a devout Christian, his mother sent him to a local Methodist school when he was about seven. Baptized a Methodist, Mandela was given the English forename of "Nelson" by his teacher. When Mandela was about nine, his father came to stay at Qufu, where he died of an undiagnosed ailment, which Mandela believed to be lung disease. His mother took Mandela to the "Great Place" palace at Mqhekezweni, where he was entrusted under the guardianship of Thembu regent, Chief Jongintaba Dalindyebo. Raised by Jongintaba and his wife Noengland alongside their son Justice and daughter Nomafu, Mandela felt that they treated him as their son, but would not see his mother for many years. He attended a Methodist mission school located next to the palace, studying English, Xhosa, history and geography. He nevertheless considered the European colonialists as benefactors, not oppressors. Aged 16, he, Justice and several other boys traveled to Tyhalarha to undergo the circumcision ritual that symbolically marked their transition from boys to men; the rite over, he was given the name "Dalibunga"
On his return to the Great Place at Mkhekezweni the King was furious and said if he didn’t return to Fort Hare he would arrange wives for him and his cousin Justice. They ran away to Johannesburg instead arriving there in 1941. There he worked as a mine security officer and after meeting Walter Sisulu, an estate agent, who introduced him to Lazar Sidelsky. He then did his articles through the firm of attorneys Witkin Eidelman and Sidelsky. Meanwhile he began studying for an LLB at the University of the Witwatersrand. By his own admission he was a poor student and left the university in 1948 without graduating. He only started studying again through the University of London and also did not complete that degree. In 1944 he married Walter Sisulu’s cousin Evelyn Mase, a nurse. They had two sons Madiba Thembekile ‘Thembi’ and Makgatho and two daughters both called Makaziwe, the first of whom died in infancy. They effectively separated in 1955 and divorced in 1958. In 1952 he was chosen at the National Volunteer-in-Chief of the Defiance Campaign with Maulvi Cachalia as his Deputy. This campaign of civil disobedience against six unjust laws was a joint programme between the ANC and the South African Indian Congress. He and 19 others were charged under the Suppression of Communism Act for their part in the campaign and sentenced to nine months hard labour suspended for two years. Nelson Mandela was arrested in a countrywide police swoop of 156 activists on 5 December 1955, which led to the 1956 Treason Trial. Men and women of all races found themselves in the dock in the marathon trial that only ended when the last 30 accused, including Mr. Mandela were acquitted on 29 March 1961. As soon as he and his colleagues were acquitted in the Treason Trial Nelson Mandela went underground and began planning a national strike for 29, 30 and 31 March. In the face of a massive mobilization of state security the strike was called off early. In June 1961 he was asked to lead the armed struggle and helped to establish Umkhonto weSizwe (Spear of the Nation). On 21 March 1960 police killed 69 unarmed people in a protest at Sharpeville against the pass laws. This led to the country’s first state of emergency on 31 March and the banning of the ANC and the Pan Africanist Congress on 8 April. Nelson Mandela and his colleagues in the Treason Trial were among the thousands detained during the state of emergency. Although initially committed to non-violent protest, in association with the South African Communist Party he co-founded the militant Umkhonto we Sizwe (MK) in 1961, leading a bombing campaign against government targets. In 1962 he was arrested and convicted of sabotage and conspiracy to overthrow the government, being sentenced to life imprisonment. On 11 January 1962 using the adopted name David Motsamayi, Nelson Mandela left South Africa secretly. He travelled around Africa and visited England to gain support for the armed struggle. He received military training in Morocco and Ethiopia and returned to South Africa in July 1962. He was arrested in a police roadblock outside Howick on 5 August while returning from KwaZulu-Natal where he briefed ANC President Chief Albert Luthuli about his trip. He was convicted and sentenced to five years imprisonment which he began serving in Pretoria Local Prison. On 27 May 1963 he was transferred to Robben Island and returned to Pretoria on 12 June. Within a month police raided a secret hideout in Rivonia used by ANC and Communist Party activists and several of his comrades were arrested. In October 1963 Nelson Mandela joined nine others on trial for sabotage in what became known as the Rivonia Trial. It is an ideal, which I hope to live for and to achieve. On 11 June 1964 Nelson Mandela and seven other accused Walter Sisulu, Ahmed Kithara, Gavan Mbeki, Raymond Malabar, Denis Goldberg, Elias Motsoaledi and Andrew Mlangeni were convicted and the next day were sentenced to life imprisonment. Denis Goldberg was sent to Pretoria Prison because he was white while the others went to Robben Island. On 31 March 1982 Nelson Mandela was transferred to Pollsmoor Prison in Cape Town with Sisulu, Mhlaba and Mlangeni. Kathrada joined them in October. When he returned to the prison in November 1985 after prostate surgery Nelson Mandela was held alone. Justice Minister Kobie Coetsee had visited him in hospital. Later Nelson Mandela initiated talks about an ultimate meeting between the apartheid government and the ANC. In 1988 he was treated for Tuberculosis and was transferred on 7 December 1988 to a house at Victor Verster Prison near Paarl. He was released from its gates on Sunday 11 February 1990, nine days after the unbanning of the ANC and the PAC and nearly four months after the release of the remaining Rivonia comrades. Mandela served time doing hard labour in Robben Island, Pollsmoor Prison, and then Victor Verster Prison while an international campaign lobbied for his release, which was granted after 27 years in 1990. Becoming ANC president, Mandela wrote his autobiography, and led negotiations with President F.W. de Klerk to abolish apartheid and establish multi-racial elections in 1994, in which he led the ANC to a landslide victory. On 27 April 1994 he voted for the first time in his life. As president, he created a new constitution and initiated the Truth and Reconciliation Commission to investigate past human rights abuses, while introducing policies aimed at land reform, combating poverty and expanding healthcare. Internationally, he acted as mediator between Libya and the United Kingdom in the Pan Am Flight 103 bombing trial, and oversaw a military intervention in Lesotho. Refusing to run for a second term and succeeded by his deputy Thabo Mbeki, Mandela became an elder statesman focusing on charitable work in combating poverty and HIV/AIDS through the Nelson Mandela Foundation. Mandela remarried on his 80th birthday in 1998; to Graça Machel née Simbine, widow of Samora Machel, the former Mozambican president and ANC ally who was killed in an air crash 12 years earlier. True to his promise Nelson Mandela stepped down in 1999 after one term as President. He continued to work with the Nelson Mandela Children’s Fund he set up in 1995 and established the Nelson Mandela Foundation and The Mandela-Rhodes Foundation. His birthday, July 18, has been declared Mandela Day, a global celebration of his legacy. When Mandela was 16, it was time for him to partake in the circumcision ritual that would carry him into manhood. The ceremony of circumcision was not just a surgical procedure, but an elaborate ritual in preparation for manhood. In the African tradition, an uncircumcised male could not inherit his father's wealth, marry or officiate at tribal rituals. Mandela participated in the ceremony with 25 other boys. For 20 years, Mandela directed a campaign of peaceful, non-violent defiance against the South African government and its racist policies, including the 1952 Defiance Campaign and the 1955 Congress of the People. 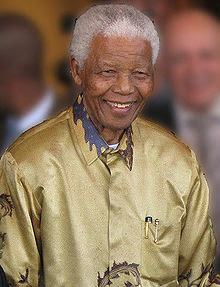 Nelson Mandela was imprisoned on Robben Island for 18 of his 27 years in prison. In 2010, Mandela made his last public appearance at the final match of the World Cup, held in South Africa. He has largely stepped out of the spotlight, choosing to spend much of his time in his childhood community of Qunu, south of Johannesburg. He travelled , visit with American First Lady Michelle Obama during her trip to South Africa in 2011. In early 2012, he was briefly hospitalized in Johannesburg to undergo surgery for a stomach ailment. He was released after a few days, and later returned to Qunu. Mandela spent nearly three weeks in a hospital in December for treatment of a lung infection and gallstone surgery. This was his longest time he had been hospitalized since being released from captivity as a political prisoner in 1990. Nelson Mandela suffered a recurrence of his lung infection and was taken to a hospital late Wednesday. He is really iconic. Even though he considered the option of armed rebellion, he never exercised that option seriously. Later on, even though he was in prison for so many years, he did not negotiate with his captors on their terms. He chose principles over freedom. Let us hope that others will be inspired by him in our generation. he was a revolutionary ! Thank you for the details about such a great man of ninety five.